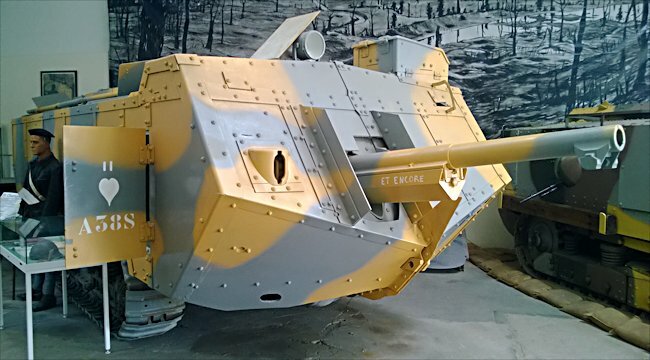 This WW1 Saint Chamond French Heavy Tank, called 'Et Encore', can be found at the French Tank Museum in Saumur in the Loire Valley. It is an upgraded mid-1918 model. The Museum is called Musée des Blindés ou Association des Amis du Musée des Blindés, 1043, route de Fontevraud, 49400 Saumur, France www.museedesblindes.fr . 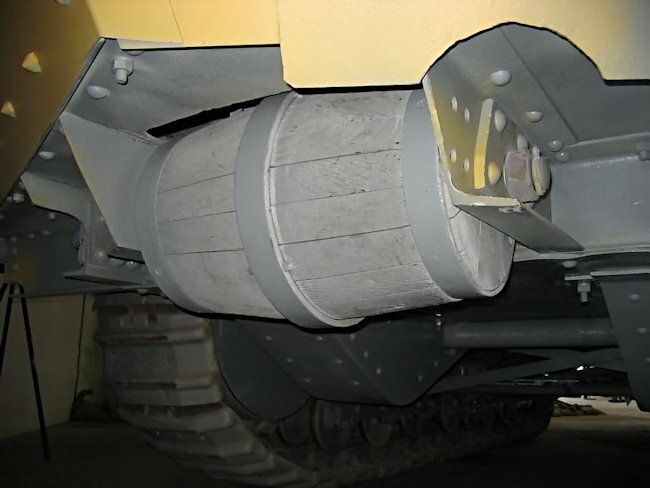 The word 'Blindés' means armoured and 'Char' is the French word for tank. The 75mm gun on this WW1 Saint-Chamond French Heavy Tank was at the front not in a side sponson like on many other tanks designs of this time period. It made trench crossing difficult. 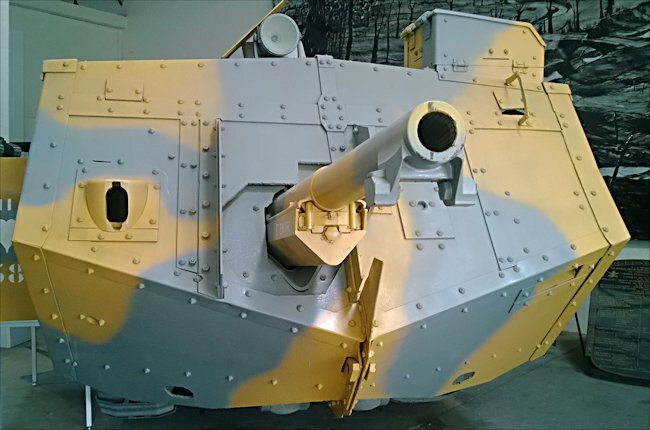 This WW1 French St-Chamond Tank was shipped to America after the war on loan, for evaluation and testing. 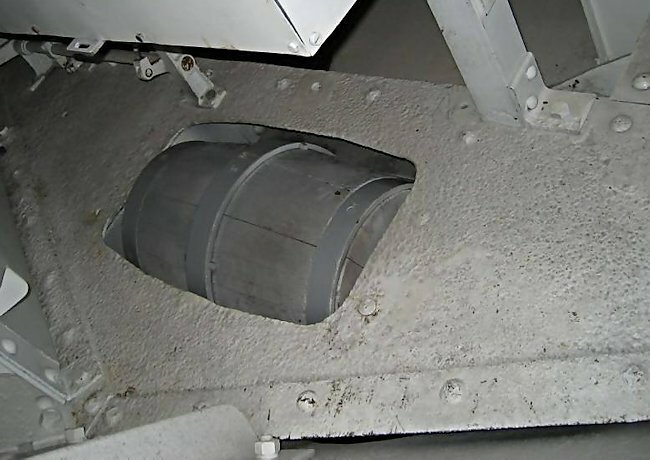 It ended up in the U.S. Army Ordnance Corps Museum, Aberdeen Proving Grounds in Maryland, USA. It was given back to the French Government, following a request for the return of their tanks, in 1985 along with a Schneider CA tank and a Renault FT tank. Its war record is not known. In 1916 the French suddenly realised they were six months behind the British in developing their own version of the tank. 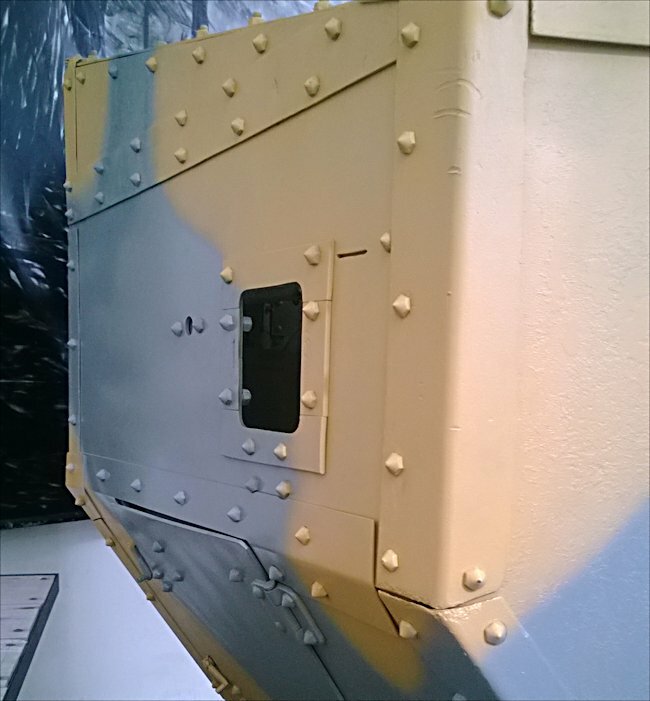 They placed orders for armoured boxes built on top of existing tracked tractor units. They failed to do extensive trench crossing trials before they placed these orders. Two early models were produced: the Schneider tank with a 75mm gun and two Hotchkiss machine guns; the St Chamond tank, which had a better 75mm main cannon and four machine guns. 17mm of armoured plate made them impervious to small arms fire penetration. They were not used until 1917. Front view of the 75mm gun on the char Saint-Chamond French Heavy Tank. 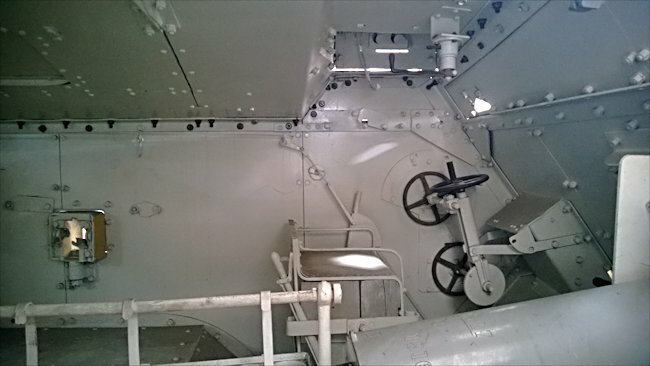 You can just see the two rollers fitted at the bottom of the tank to help it get over trench walls. When the Germans saw the British Mark I tanks easily crossing the front line trenches they countered this new development by making their trenches 8ft wide. It did not stop the British who just made their new tank models like the Mark IV, longer and longer. It stopped the French St Chamond and Schneider tanks. They just could not traverse the wider trenches. They nose-dived into them and got stuck. To progress they had to find sections of trenches that had not been widened. The two French tanks were also blighted by mechanical unreliability. If your tank broke down on the battlefield the crew had to get out fast and try to crawl back to their own lines. If they got captured they would be shot by the enemy infantry who hated being attacked by tanks. The main reason was that the German artillery would zero onto the disabled stuck tank’s location and bombarded it again and again. This was the second heavy tank produced by the French during the First World War. It was manufactured by FAMH Mecanique Creusot Loire during 1916 in the town of Saint-Chamond. Four Hundred St-Chamond tanks were built. It was not very effective on the battle field because of its poor maneuverability. By 1918 it had been completely replaced by Renault FT17 tanks and British heavy tanks driven by French Army crews. It had a 75mm L12CTR gun. The early vehicles had a main shorter gun. 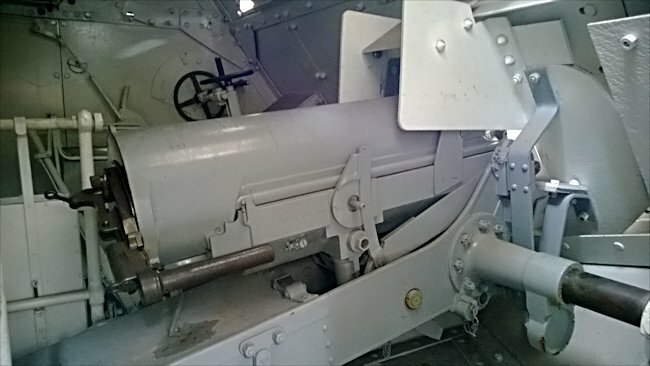 The original 'short' gun, was a Mle 1915 St Chamond gun but it was later replaced by the longer Mle 1897 Schneider gun. It had a crew of 8 men and a combat weight of 22 metric tons and a 90 hp engine. 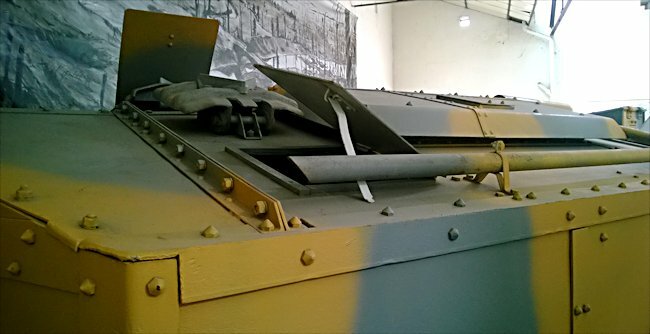 Top escape and ventilation hatches next to the exhaust pipes on the roof of a WW1 Saint-Chamond French Heavy Tank. Notice the roof is pitched so grenades would roll off. The early versions of the tank had a flat roof. The design of the Saint-Chamond French Heavy Tank had a grounding fault. The main reason for St.Chamond getting stuck in the mud was the front of the hull, which was extending too far forward. The gun was high enough not to cause big problems unless the ground slope was too steep. But the amount of weigh unsupported beyond the front idler was too heavy. Later into production the French added support rollers in the front and back. 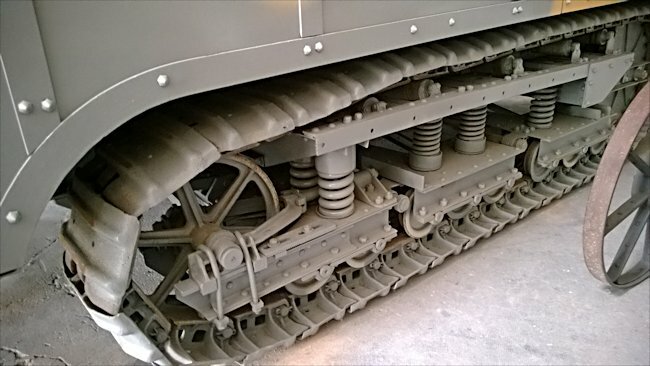 After WW1 this tank was sent to New York. It was exhibited on the Josselyn Hockey Field at the Vassar College, Poughkeepsie in New York state for a 20 years. It was a gift from the French government in thanks for the college's assistance during the World War One. Students served as nurses, set up a temporary school, arranged for scholarships, organized a 'Cantine Populaire' food kitchen for French civilians, among other activities especially in the Verdun area. It arrived at its new home on 11th November 1920 as part of the Schools Armistice Day celebrations. As both drinking Prohibition and college parietal laws were in effect at the time, it was difficult for the older school girls to find a place to indulge in their vices. Supposedly, girls would meet inside the tank to drink liquor-which they referred to as 'getting tanked.' Apparently, though, other schools have similar legends, and the term probably originated before this time. The girls would also go inside the tank to smoke cigarettes. There is a story that College President MacCracken was taking an evening constitutional, when he noticed smoke emerging from the tank's cannon, generated by Vassar undergraduates illegally smoking inside the tank. What happened to the tank next? No Saint Chamond actually fought outside France, despite some rumors that a handful were sent to the Polish forces fighting against the Soviets in 1919. The sole survivor was sent to the U.S. Army Ordnance Corps Museum, Aberdeen Proving Grounds in Maryland, USA for evaluation and tests after the war. It was given back after a 67 year loan and arrived in France in 1985 along with the Schneider CA and Renault FT tank that had also been on loan. Thay are all on display now in the Saumur museum (Musee des Blindes). 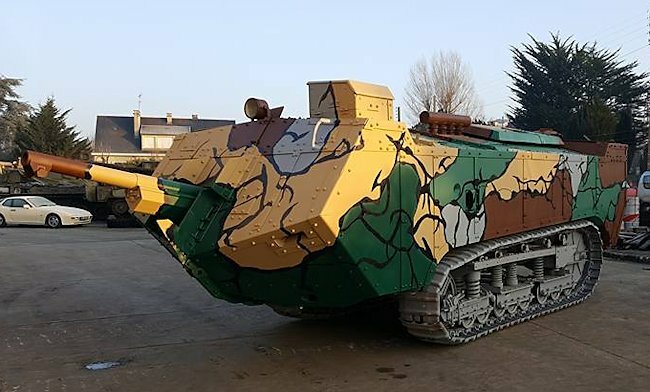 In 2016 the French Tank Museum sent their St Chamond tank to Roanne (near Lyon) to a company called APPRES Industrie who has the contract for the maintenance and modernization of vehicles from French Army. 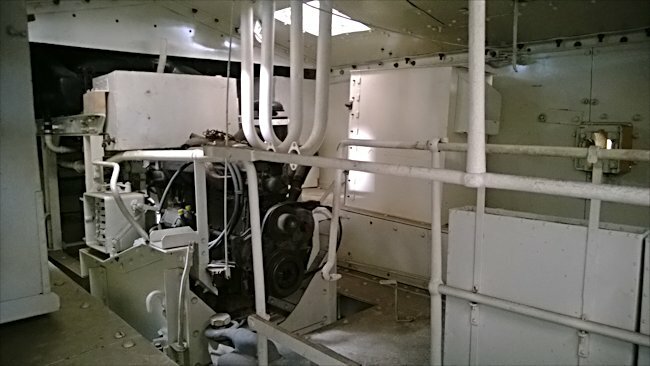 The objective was to restore this very rare WW1 tank to running condition in time for the the 2017 100 year anniversary. The author Steven Zaloga visited the U.S. Army Ordnance Corps Museum, Aberdeen Proving Grounds museum before it closed. Each vehicle had a 'property jacket', a file that contained all the information and documnets relating to that specific vehicle. In the WW1 tank files there was nothing regarding their military history. The saddest collection of files were in a file drawer of "de-accessioned" (scrapped) vehicles that were sent to the Baltimore smelters over the years. This included a very rare German WW1 A7V heavy tank. What a waste. 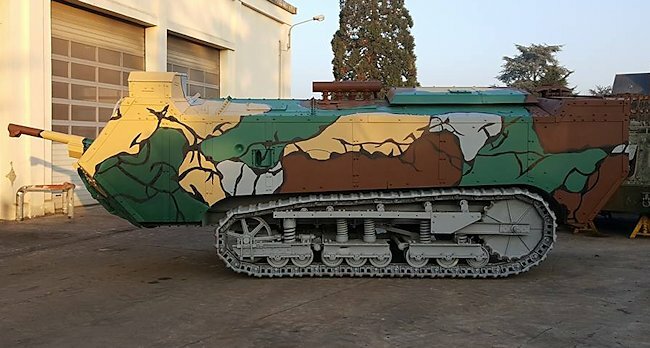 The French Tank Museum took both the WW1 Schneider CA tank and the Saint-Chamond tank off public display in 2016 and financed a major restoration project. They had mechanical overhauls as well as a more accurate camouflage livery.